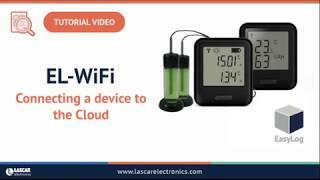 This video describes the process required to connect an EL-WiFi device to the EasyLog Cloud. WIFI: The WiFi devices contain program code that runs internally, often referred to as firmware. You can update the firmware in a device by running the Firmware Updater software (installed on your PC with the WiFi Sensor Software). You’ll need to connect the device to the PC using the USB cable provided then follow the on-screen instructions to download and update the latest firmware versions. To benefit from the latest improvements we recommend using the latest firmware releases for your devices. Depending on the previous firmware version, your device may be in a factory-reset condition following a firmware update, and will need to be connected to the EasyLog™ Cloud using the EasyLog™ WiFi Software. Any existing data for this device on the EasyLog™ Cloud will be archived for safe-keeping. MOTE: The MOTE can be updated via the device page on www.Easylogcloud.com via either the device cell or from the Burger menu located at the top right of the devices page. If you have an update pending you will see a yellow warning triangle will appear in the device cell. Clicking this will open up a pop up with information on the pending firmware update and give you the option to install an over the air firmware update. Alternatively multiple devices can be updated via the burger menu in the top right of the devices panel, by selecting any of your devices, then opening the burger menu, selecting the “Update Firmware” option. 2) Ensure MAC filtering is not switched on in the access point or router. If it is switched on, only known devices will be able to connect to your router. 3) Check that your network has an internet connection. 4) Check that the device is in range of the router. 5) Check to see if the router has the latest firmware. 6) If the access point or router has WEP Encryption ensure that the HEX key is being entered rather than the password. You can find the HEX key in the internal settings of your access point or router. Alternatively, search the web for resources to help convert your password to a HEX key. 7) Check that DHCP service is running. This allows the device to be allocated an IP Address. Normally, the DHCP service runs in either your router or on a network server. Make sure that the configured DHCP IP address range allows the addition of new devices if not, then extend the range. 8) If your wireless network uses WPA Enterprise, make sure that the correct authentication type is selected from the drop-down box. Only the types listed are supported. 9) Make sure that the SSID name does not contain spaces. How many Devices can I connect to my EasyLog™ Cloud account? The number of Devices you can connect will depend on which type of EasyLog™ Cloud account you have. This will be Starter or Professional. For more information visit your account vitals via the accounts tab on the navigation bar. My devices are not communicating with the EasyLog™ Cloud? WIFI: If your access point or WiFi router is working, your device may be out of range. You can check the range of the devices by pressing the device button three times. This will show a number between 1 and 10 if you have a signal, with 1 being a low signal and 10 a strong signal. When the device shows ‘- -‘ there is no signal. This video explains how to access and view sessions. Does it cost to use the EasyLog™ Cloud? If you have Signed-Up with EasyLog™ directly our charges will depend on which account type you have chosen and how many devices you require connected to your account. How do I force a transmission from my WiFi device? WIFI: When the device is displaying the main reading screen on the LCD, press the button on the front four times. The MAX, MIN and Signal Strength screens will be quickly displayed. The device will try to transmit its latest data immediately, regardless of the Sync Schedule setting. MOTE: To force a transmission from the MOTE press and hold the main button on the front of the device for two seconds. This should be confirmed by a second beep from the device. In order to manage data received from your device efficiently, the EasyLog™ Cloud divides data up into what we call ‘sessions’. Your device will begin a session when it first begins logging. 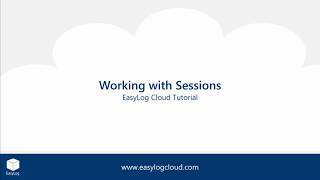 If you make any changes to the device such as a sample rate or alarm level change, the EasyLog™ Cloud closes and saves the current session and a new session is started. A complete list of all sessions is shown within the Session List Button on the Data page. All sessions have the ability to be merged together via this button so you will be able to see all data recorded by this device in a single data view. WIFI: The device can be reset by holding the button for 10 seconds. Release the button when RST appears on screen. The device will retain all settings but will lose any data that had not been transferred to the EasyLog™ Cloud. It will continue to be connected to the account it was set-up with and will simply start a new recording session. If necessary, a full factory reset can also be performed by holding the button for 20 seconds until FArS appears on screen. Doing this will return the device to the factory state, deleting all settings and clearing any remaining data. The device will no longer be connected to any network or EasyLog™ Cloud account. IT IS RECOMMENDED THAT YOU ARCHIVE THE DEVICE ON YOUR EASYLOG™CLOUD DEVICES PAGE BEFORE UNDERTAKING A FACTORY RESET. MOTE: To Reset a MOTE device you will have to unscrew the back and remove it to expose the battery bay of the device. Then you will need a paperclip or a pen to press the black reset button located centrally within the compartment. One press and release of this button will reset the device, this is confirmed by a two beep signal once the button has been released. The device will retain all settings but will lose any data that had not been transferred to the EasyLog™ Cloud. It will continue to be connected to the account it was set-up with and will simply start a new recording session. If necessary, a full factory reset can also be performed by holding the button for 10 seconds until you hear a two beep signal that repeats until the reset button is released. Doing this will return the device to the factory state, deleting all settings and clearing any remaining data. The device will no longer be connected to any network or EasyLog™ Cloud account. IT IS RECOMMENDED THAT YOU ARCHIVE THE DEVICE ON YOUR EASYLOG™CLOUD DEVICES PAGE BEFORE UNDERTAKING A FACTORY RESET. Select the device(s) you wish to Archive or Delete, Then click on the menu button in the top right of the Devices Page, this menu contains the options for both archiving and deleting a device. The WiFi icon on my device is flashing, what does this mean? WIFI: This means that the device is not connected to the EasyLog™ Cloud. Check your network connections first and then make sure that the device is within range of the access point or WiFi router. To save battery power, the device may be in sleep mode for up to 30 minutes and will then look for a connection again. No data is lost while the device is temporarily not connected. Once connection is resumed all data will be synchronised with the EasyLog™ Cloud. The only way device data is lost is if you delete a device. The EasyLog™ Cloud asks if you definitely want to delete the device so you will not be able to do this by mistake. If you have a Starter account, the EasyLog™ Cloud stores only the most recent 45 days of data. Data older than this is automatically deleted. If as a Starter you wish to upgrade to 2 years of data storage, you can do this via the "Account" Navigation Menu Option providing you have the relevant permissions. If you have Signed-Up with EasyLog™ directly, you can upgrade your account at any point. Downgrade is also possible, depending on the number of devices you have connected to your account. You cannot downgrade to a STARTER account. To make changes to your account, Click on the "Account" menu option from the Navigation Menu Bar, This should bring you to your Account settings tab (Providing you have the correct user permissions) where you can make adjustments to your account. 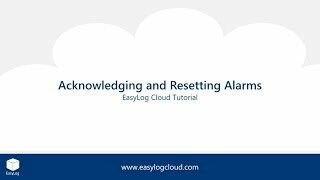 This video explains the process required to acknowledge or reset alarms. This means that you have changed a setting on a device, for example the transmission rate, an alarm level. The device will receive its new settings the next time it transmits to the EasyLog™ Cloud, the set-up will be pending until that time. How can I access the EasyLog™ Cloud? You can access your EasyLog™ Cloud account using any internet enabled device through a web browser. This could be your PC at home/office, your iPad/tablet or your mobile phone, etc. The EasyLog™ Cloud supports the latest Chrome, Internet Explorer, Firefox, Edge and Safari browsers. Data charges may apply if viewing data from your EasyLog™ Cloud account on your mobile phone. Alternatively you can access your account via the Easylog cloud App. What is the difference between the Sample Rate and the Sync Schedule? The sample rate sets how often the Data Logging device records a reading. The Sync Schedule sets how often the Data Logging device transmits this information to the EasyLog™ Cloud. Choosing the right sample and sync schedule for your specific needs is vital to ensure that you maximize battery life. Every application is different so we have made the system as flexible as possible. How do I charge the battery in my device? WIFI: The device will arrive partly charged but ideally you should charge it for 24 hours before use for optimum performance. The battery can be recharged via a PC, a USB +5V wall adapter, or a portable USB battery pack using the USB lead provided. Why are some of my tabs on account settings inaccessible? If you're having trouble accessing these tabs to change location or user settings, please try reducing the zoom level on your browser. This can be done by using Ctrl-. On mobile devices these may be inaccessible due to screen size.